The Toby is an annual and epic charity coast to coast run that raises thousands of pounds for St.Oswald’s Hospice. You can do as much or as little as you feel able to do over the course of three days (Friday to Sunday) and the team covers each section in small groups, followed by the Harrier minibus, so you’re never on your own. It’s great fun, with loads of banter, grit and determination, not to mention plenty of baked treats to keep the energy levels up over the weekend. Every year covers a different coast to coast route so watch this space for all the info on 2016’s adventure. There were highs – a few hills, there were lows – Kev’s surprise outfit on the second night, and there were tears – Julie Collinson wearing Kev’s surprise outfit! I can’t possibly remember everything that happened over the weekend. It’s late on Sunday night, I’m very tired and I’ve had a few (well deserved pints). So, here are the highlights but if any Toby runner wants to add their own, please feel free to leave a comment. Day 1 – and we’re off! Fifteen hardy souls left Wallsend for the start of the Reivers cycle route on Friday morning. We set off slightly later than planned because someone, who will remain nameless (Ian Gowing), slept in! I think Ian’s fate was sealed for the rest of the weekend from this point on. We arrived at Whitehaven and had the customary photo from the C2C sign and then the first leg set off. Only 172 miles to go till Tynemouth! On Ian’s first run of his first Toby he had the misfortune to pick up a calf injury and could not run for the rest of the weekend. Instead he made up for it by riding the support bike and on the last day he biked all of the legs, the last 52 miles non-stop! Ruth Marshall, returning from injury and unable to run, cycled as well over the weekend. A fair few miles and many laughs later, we arrived back safe and sound at a reasonable time for the first night in Carlisle. I think we were all very happy to have a good feed and rest ready for the next day. Day 2 – we’re off to Kielder! Overnight we had a couple of additions to our squad and we set off bright and early. It was a bit colder on the second day and everyone did their share of the miles. The banter and laughs continued throughout the day. Harry ‘the mountain goat’ Coates had the pleasure of running 14+ miles along the trail through Kershope Forest and up to Kielder with just Kenny Chambers on the bike for support. Impressively they did it in roughly one hour 20 minutes. For the first time on the Toby there were maps for the runners to carry on each leg as it has become tradition that every year someone gets lost. We were doing so well and towards the end of the second day no one had gone off course. Oh no! I spoke too soon! On the last leg of the day down from Kielder Dam to the digs at Boe Rigg, half a dozen of the group plus the bike support somehow managed to miss the cycle route and get lost. The rest of us were panicking! Where could they be? One of the buses and Bill Todd (who had met us at Kielder) set off to find them but they were nowhere to be seen. By this time it had turned cold and it was raining. Their leg was roughly eight miles long and two hours after they set off, they eventually all turned up together at Boe Rigg! The route had not been signposted, they went off course and ran an extra two miles. Were they sad? No! Were they disheartened? No! Despite their detour they turned up with smiling faces and had a story to tell that night. That’s the Wallsend way of course! Brian Hetherington, Harry and Andy Graham ran the first leg of the day in an impressive time and for part of their run they were clocking sub-six minute miles! They weren’t racing or breaking a sweat even on the tough hill on the last mile towards the changeover point. The hero of the Toby weekend award definitely goes to Michelle Heron. For some unfortunate reason Michelle had to run many horrendous hills over the weekend (sorry Michelle, Kev and I honestly didn’t do it on purpose!) 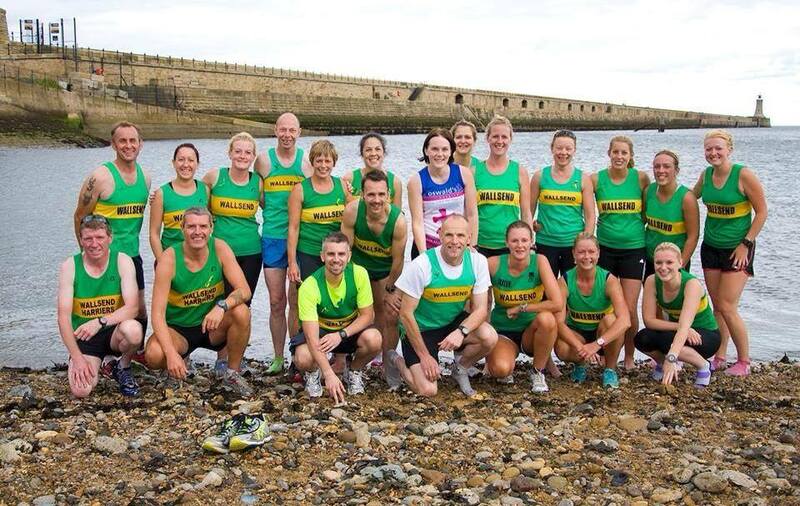 With true grit, determination and Wallsend spirit, Michelle got up all of those hills and completed her allotted runs. A few cans of Irn Bru might have helped her along! The last leg of the day along the Fish Quay at North Shields all the way up to Tynemouth is an amazing experience. Everyone running at the same pace whether they’ve ran 30+ miles over the weekend or just joined in for the last leg on the last day. 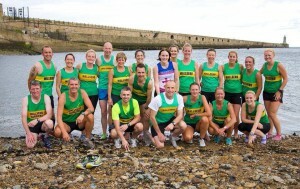 Friends, family and supporters were there to meet us on that hill at Tynemouth. Not forgetting the now infamous ‘there are five types of people’ speech during the last mile to motivate and congratulate everyone on their efforts. Thanks to all of those who biked along the route to keep us safe and support us. Thank you to Bill for meeting up with us on the second day and supporting us along the way. A familiar friendly face is always welcome. Thank you to Kevin Payne for organising the Toby. Thanks to Kev and Ruth for helping me organise the route and the legs. I would like to say thank you to all of those who I ran with over the weekend, great company and good banter. Thank you to all of those who looked after me on Friday when I was still feeling the after effects of my illness from the previous week. Well done to everyone who ran, whether it was your first or fifth Toby, whether you ran all three days or just one day or one leg. It was a great team effort and you should all be proud of yourselves for what you have achieved running for a great cause – St Oswald’s Hospice. – The change over rituals! – The red wine drinkers! – Much fun with the walkie talkies! If you weren’t there, you’ve missed out! For those of you who haven’t experienced the Toby before, sign up for next year! It’s a cracking weekend with an amazing group of people. I wouldn’t have missed it for the world!